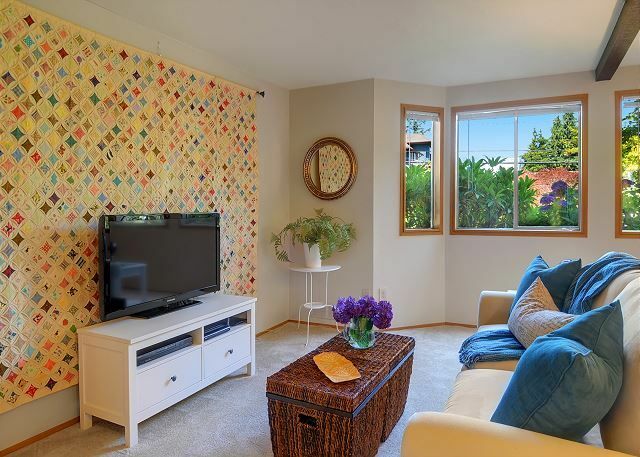 Adorable Phinney Suites Apartment, Secure Parking, Great Walk Score! Welcome to Phinney Ridge, one of Seattle's most popular neighborhoods! This clean, one bedroom, attached dwelling apartment can accommodate up to four people with a Tempur-pedic queen bed in the bedroom and an uncommonly comfortable American Leather Sofa Sleeper in the living room. Off street, designated parking and private entrance. No carrying luggage or groceries in the rain; this home has direct access from the garage to the unit down a hallway. Level entry, not a single step or stair to navigate. There is a shared Washer and Dryer with this unit! You will love exploring the Phinney Ridge neighborhood and living like a Seattlelite for your stay. All the necessities and comforts of home- expanded cable with HBO, local telephone service and wireless internet access all included. Linens and start up supplies are also provided. Lovely garden space to enjoy, as seen in our photo gallery. Want to bring more friends and family? The Phinney Suites Retreat (https://www.vrbo.com/1019504) is right upstairs and sleeps up to 4 more guests. Traveling with an even larger group? We currently offer two additional rentals in beautiful Phinney Ridge: Phinneywood Bungalow (https://www.vrbo.com/1019505) and Classic Craftsman (https://www.vrbo.com/1019486). Contact us directly to find out more or book multiple rentals for a bigger party! This vacation rental property in Seattle is professionally managed by Sea to Sky Rentals! We are a small local company that specializes in vacation rental management in the Pacific Northwest and has been in business for over 10 years. Call or email us anytime! We are always happy to help you plan your Emerald City vacation. I was disappointed with the unit. It was dirty and looked like it hadn't been cleaned for a while. Carpets were dirty with dark spots which looked like wine or grease. Seemed as though the unit could have been cleaned well in advance of my arrival. No screens on windows so I couldn't open them up. Area is lovely with plenty of shrubs, but that meant plenty of insects. So, unfortunately, I couldn't get fresh air into the unit. One good thing is the location. Phinney Ridge area is perfect for tourists and it was close enough to the freeways but the directions to the unit was confusing. The directions need to be revamped to a more logical approach and not through the Woodland Park Zoo area where street names changed and underpasses not on the maps. One good thing is that the rental agency did try to get my concerns addressed but were unable to because their cleaning group didn't have a key to the unit. So while I was out visiting with friends, they were unable to access the unit to get the rug cleaned up and screens put up on the windows. Pleasant apartment in a lovely neighborhood. We three adults stayed in the apartment for 4 nights. The neighborhood was lovely and convenient to public transportation -- we took the bus downtown several times. There are several local restaurants and an upscale grocery store within a few blocks. We were, however, surprised at the lack of tourist information provided -- no maps, public transportation information, no suggestions of what to see and do in Seattle. We did appreciate the 3 keys left for our use, one for each of us. Also, the only check-out information was a reminder to leave the keys. The apartment was very pleasant, with lots of storage space. The carpet definitely needed cleaning or replacing, and screens on the windows would've kept the bugs out. We've stayed in dozens of short-term apartments, and were surprised at the lack of staples. Usually other guests have left a variety of goods, like extra coffee and filters, cooking oil etc. The only such item was a salt and pepper set. The other inconvenience came about as there were 3 of us. One person was using the sofabed for sleeping, so other than the eating area, that left only 1 chair for the others to use. Great location to food store and restaurants. Quiet neighborhood. The apartment is bright with lots of color pops. Large main room windows lets in lots of natural light. The kitchen is well equipped. Bath towels plentiful, the bed is a king and is comfortable. Nice to have a laundry to freshen up clothes. Parking space and garage acess a plus. The rug in the main area should have been shampooed as it had quite a few stains since part of it is close to the kitchen space, would also recommend screens on the windows. The Management company is very professional and provided excellent directions for arrival and entry instructions. They were accessible if you have any questions and responded quickly. We would re-rent this apartment on our next visit to Seattle. There were no screens in the windows, which made it tough for how hot it was while we were visiting. We had to open them for a bit (because of how hot it was) and despite our best efforts, ended up letting in a large spider, which was not fun. I was under the impression we could park in the garage, but the button we were given opened the OTHER garage door. I emailed Friday morning (we arrived Thursday evening) about both the button and screens and received no response. We never did end up getting to park in the garage, but having the driveway parking was nice. The upstairs bathroom is right above the bedroom so you can hear that first thing in the morning. The location is not particularly far from downtown, but traffic is always awful resulting in long drives and/or expensive Uber trips. All in all, it’s a cute place with great food and a cute yarn store close by, and if it had been more reasonably priced, I probably wouldn’t have had any issue with it. The expectations were much higher for what was charged and it was a let down. Can hear all walking in floor above. Hopefully, upstairs neighbors are on your sleep schedule.